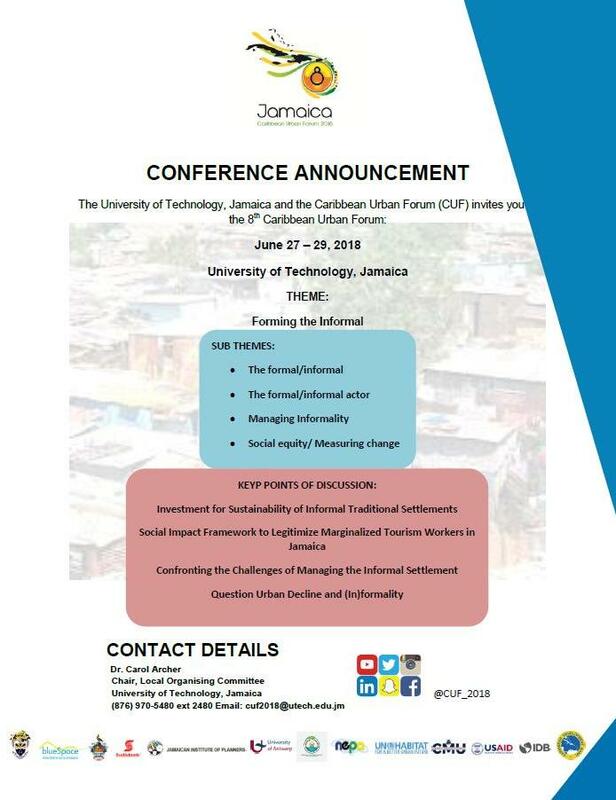 UTech, Jamaica Hosts 8th Caribbean Urban Forum (CUF2018) — UTech, Ja. 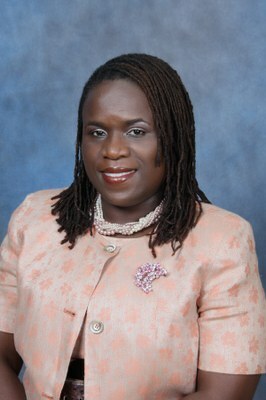 The University of Technology, Jamaica through its Faculty of The Built Environment in partnership with the Caribbean Network for Urban and Land Management (CNULM) based at the University of the West Indies, Trinidad and Tobago will host the 8th Caribbean Urban Forum from June 27 - 29, 2018 at the University’s Papine Campus. On Tuesday, June 26 and Wednesday June 27, there will be a pre-conference training workshop titled, “Tools and Techniques for Formalizing Informal Settlements and Economies.” This training workshop is sponsored by the UN Habitat and United States Agency for International Development and targets residents from informal communities, community development specialists and policy makers. The 2018 Forum which will be held under the theme, “Forming the informal,” brings together land use practitioners, municipal managers, policy makers, academics and allied professionals to address urban issues in the region. The wide ranging discussions planned for the two-day Caribbean Urban Forum will seek to address these and other issues related to heritage, history, housing, infrastructure and policy in informing a contemporary understanding of the Caribbean urban condition. Conference delegates from approximately 25 countries including Saudi Arabia, USA, Haiti and Guyana are expected to participate. A distinguished cadre of local and international experts will make presentations on a range of topics related to current and future urban challenges in Jamaica and the Caribbean region. Presenters include Maria Estefania Barrios, University of Florida who will lead a discussion on “Enhancing resiliency in the public, formal and informal residential context proposals – a Case Study for Puerto Rico communities; Sophonie Milande Joseph, Columbia University, USA who will moderate a panel discussion on “Transitional Urbanism in Ayiti: Law, Decentralization & (In) Formality; Gladwin Charles from the Central Housing and Planning Authority, Guyana who along with other regional experts will present the case for “Engagement and participation in the transformation of informal settlements in Guyana, Isau G. Bailey, National Environmental Planning Agency (NEPA) who will look at the issue “Symbiotic or Independent: Role of Local and Central Government towards managing informality in Jamaica,” among other local and international presenters. The Caribbean Urban Forum will be preceded by several related regional activities including the Annual General Meeting of the Caribbean Planning Association (CPA); business meeting of the Caribbean Association of Local Government Associations; project meeting/ training in Problem Based Learning ( CITYLABS CAR); a panel discussion on the redevelopment of Bermuda post Hurricane Irma and a panel discussion on the Caribbean Development Bank’s Urban Policy, as well as a debating competition addressing forceful removal of residents in informal communities by students from UTech, Jamaica’s Faculty of The Built Environment. Sponsors of CUF2018 are Caribbean Development Bank (CDB), Inter-American Development Bank (IDB), UN Habitat and Scotiabank. For further information on the conference and the events being held prior to CUF 2018, interested persons may contact Dr. Carol Archer, Chair, Local Organizing Committee, University of Technology, Jamaica, Phone (876) 970- 5480 Ext 2480 or email: cuf2018@utech.edu.jm.